(VOV) – About thirty European scholars attending a recent workshop in Norway refuted China’s groundless claim of the ‘nine-dash line’ or ‘U-shaped line’ in the East Sea, saying it cannot be used for sovereign negotiations. Meeting at the Norwegian Institute of International Affairs (NUPI) on June 5, delegates examined challenges to maritime security in East Asia, especially mounting tensions in the East and East China Seas that might cause conflicts in the region. They also underlined the need to build confidence and strengthen maritime security cooperation in the Asia-Pacific region. A representative of the Vietnamese Embassy updated the delegates on major developments in the East Sea and Vietnam’s initial steps towards settling the territorial dispute after China illegally stationed its drilling rig Haiyang Shiyou-981 deep inside Vietnam’s exclusive economic zone, and dispatched vessels, including warships, to intimidate and attack Vietnamese law enforcement boats. The scholars expressed their deep concern about China’s unilateral action against international law in the East Sea, which they said is threatening security and safety of international navigation. Professor Geoffrey Till from Defence Studies Department at King’s College London said China failed to respect and fully observe the 2002 ASEAN-China Declaration on the Conduct of Parties in the East Sea (DOC), that could lead to potential conflicts. The delegates discussed China’s provocative actions in the East Sea, as well as their impact on security and stability in East Asia which has been the centrepiece of the world public for more than a month. Professor Stein Tonnesson from the Peace Research Institute Oslo (PRIO) and other delegates shared the view that China should respect international law. They called on China and other parties concerned to develop an effective mechanism for controlling potential conflicts in the East Sea and to sit at the negotiating table to handle disputes peacefully. At a recent interview granted to Vietnam Television, European scholars supported Vietnam’s use of legal actions against China in accordance with international law. Professor Bernard Insel from University of Brussels noted that the position where China is placing its oil rig is clearly inside Vietnam’s exclusive economic zone. According to the professor, the issue is more complicated when China claims sovereignty in the rig area of Vietnam’s Hoang Sa (Paracel) archipelago that China used force to occupy illegally in 1974. Professor Eric David from the Free University of Brussels stated that China’s actions are provocative, because it is aware that the waters where the oil rig is standing are part of Vietnamese territory. Vietnam has the right to say that the Chinese move threatens its sovereignty, as well as global peace and security. Besides Vietnam, he said the Philippines is also engaged in a similar territorial dispute with China, and the country has decided to bring China to the international arbitration court in the Hague. Lawyer Eric Van Hooydong, an international legal expert, said if bilateral or multilateral negotiations collapse, Vietnam could sue China in the International Court of Justice or the International Tribunal for the Law of the Sea in Hamburg, Germany. Vietnam should also seek another solution through arbitration mechanism, he suggested. (VNA) Countering inaccurate allegations and arguments by a number of Chinese scholars concerning China’s illegal placement of the drilling rig Haiyang Shiyou-981 deep inside Vietnam’s exclusive economic zone and continental shelf, researcher Hoang Truong published an article under the above title, highlighting the historical truth. Following are excerpts from his article. Recently, a number of relatively official media outlets in China, such as the Global Times and International Herald, published a series of articles by Ke Xiao Zhai and Lu Jian Ren, who are working at the Guangxi Institute of Southeast Asian Studies, on China’s illegal placement of the drilling rig Haiyang Shiyou-981 deep inside Vietnam’s exclusive economic zone and continental shelf. In the general definition, scientific research means collecting and processing information so as to find out the nature of events, phenomena and processes. But it is regrettable that these “scholars” have messed them up. To create a “scientific” air, Mr. Ke has fabricated and analysed four mazes. The first is that Vietnam “always naturally wants to attack China”. Don’t you know that the Vietnamese have never invaded China? Have you ever seen Vietnamese troops in Guangxi, which shares mountains and rivers with Vietnam, except for once when they joined the China People’s Liberation Army in Xi Kun Ling? As for the other side, it is clear to everybody that we, the Vietnamese, always cherish peace and friendship, having experienced bloodshed time and again. It is also clear that we are ready to put the past aside to look to the future. This is a natural characteristic of the Vietnamese towards our northern neighbour. Mr. Ke fabricates a claim that in 2007, when the demarcation of the land border between Vietnam and China had not been completed, Vietnam worked out its “sea strategy towards 2020” aiming to expand the area of the East Sea, and that this is the cause of the escalation in the conflict between the two countries. For millennia now, we the Vietnamese have known only too well the legend which has it that Lac Long Quan and his wife Au Co divided their brood into two; 50 of the children followed their father to the sea and the other 50, their mother to the mountains. This shows that our sense for the sea of our nation has been nurtured for millennia, not from 2007, simply because all one side of our country faces the sea and 28 out of Vietnam’s 63 provinces and cities are located along the coast. The strategy mentioned is not the first; such a strategy has existed for a very long time, and did not need to wait for the completion of the demarcation of the land border to come into being. If Mr. Ke wishes to touch upon the occupation of Hoang Sa (Paracel) and Truong Sa (Spratly) archipelagos, I would like to say that in Hoang Sa, Vietnamese have been present for several centuries now while the Chinese are nowhere to be seen there. Even China’s maps for centuries have marked Hainan Island as China’s southernmost border. Only in 1956 did China send troops to occupy the eastern part of Vietnam’s Hoang Sa and in 1974, it occupied the western part. Similarly, Vietnam has been continuously and peacefully present in Truong Sa archipelago for a long time now; only in 1988, 1989 and 1995 did Chinese troops jump in to occupy seven shoals. So the question here is who expanded the presence and occupation? Moreover, it is China, not Vietnam, who claimed the huge “nine-dot” line that covers almost all the East Sea on the basis of no law; while Vietnam has only drawn up its exclusive economic zone and continental shelf exactly as prescribed by international law, especially the United Nations Convention on the Law of the Sea in 1982, to which China is a signatory. So who expands its area of sovereign right? Mr. Ke also says that visiting Vietnam last year, Premier Li Keqiang raised the “nice idea” of joint exploitation but Vietnam refused on the grounds that Vietnam’s exclusive economic zone and continental shelf are undisputed. It’s true, Mr. Ke! 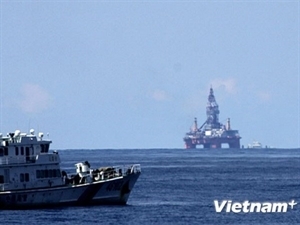 On its exclusive economic zone and continental shelf, Vietnam has been conducting joint exploitation with tens of foreign companies on the basis of exercising Vietnam’s sovereign right. Vietnam has more than once invited Chinese companies, including the China National Offshore Oil Corporation, to join but you have been insisting on “joint exploitation” in the sense that the “nine-dot” line invented by China belongs to China, and now it gives Vietnam a favour by joining the exploitation. Is there any garden in the house left to you by your forefathers? If yes, will you be willing to let your neighbour raise his chickens there at his will with the argument that the garden is not completely yours but an area disputed by the two families? I also heard that your ambassador in the US complained that China placed only one drilling rig while Vietnam had many. When it is not yours, one is illegal but when it is truly mine, even thousands are legal. The second maze Mr. Ke fabricates is that Vietnam wants to use this to realise “national reconciliation”, sacrificing the Vietnam-China relationship in exchange; and as the situation spills out of control, the power of an anti-Communist and an extremist national force has taken shape. If somebody placed a huge drilling rig in the water belonging to China, as prescribed by international law, how would the Chinese, including those working and residing in Hong Kong, Macau and Taiwan, think and act? The root cause of the situation is China’s wrongful act that violates Vietnam’s sovereignty and sovereign right, not what Mr. Ke imagines; that Vietnam wants to take advantage of this to achieve national reconciliation. In the blood of the Vietnamese, there is nothing like extremist nationalism because we have been invaded by major powers, one after another, which forced us to shed blood to safeguard our country. If we keep hatred in our hearts, with whom can we live then? The third maze Mr. Ke wishes to drive us down is the slanderous allegation that Vietnam hopes to take advantage of schemes by some countries who want to use Vietnam to “contain” China, availing itself of the chance of the drilling rig Haiyang Shiyou-981 to “cry out, exaggerate and jump”. Still a developing country after having experienced years of war, Vietnam has only one desire, for peace and stability for national construction. “Containing” major powers is simply not our goal. In history, Vietnam has repeatedly been taken advantage of and suffered from bargaining behind its back and, subsequently, contained. Mr. Ke has taken a wrong turn, and I urge him to please study again the history of 1954, 1972, 1979, 1989 and so on. Having learnt those unpleasant lessons, we have always persisted with the foreign policy of independence and self reliance. We do not join anyone against any other. Mr. Ke also says we “cry out” by denouncing China at every international forum for support from the international public. Is it true that we should be banned from crying when we are hurt? Mr. Ke also accuses us of having “exaggerated” right at the beginning of the incident and blamed China for “undermining peace and stability”. Well, I say this to Mr. Ke. It is best for China not to cause any incident, and then Vietnam will have no grounds to exaggerate anything. It is a great pity that the Haiyang Shiyou-981 case is so big and brazen that the principle of considering a major case to be a minor one and a minor one to be nothing can no longer be applied. As for the question of who is undermining peace and stability; the international public is wise enough to make a judgement without needing us to “exaggerate”. The fourth theory that Mr. Ke suggests is that we are using the lessons of national strength and a united people, which he himself recognises as “valuable experience helping Vietnam to win the two wars of resistance against the French and the Americans,” and applying it to educate and encourage the whole population to determinedly safeguard our interest in the sea and islands. In this, Mr. Ke is quite right, but I want to add some points. First, this is not a lesson drawn from only the two wars, but also from thousands of years of national building and defence. Second, our nation is “blessed” to always fight foreign aggressors who are, materially speaking, many times more powerful than us. If we do not use our people’s strength, unity and wisdom, how can we fight them? And third, our state is of the people, for the people and by the people, so who else should we rely on if not our people? As for other articles, I shall comment on them in due course.